Upon yesterday’s arrival to the Wasilla dance studio where Bristol Palin and Mark Ballas will be rehearsing, a large crowd of fans, including 2012 Presidential hopeful Gov. Palin greeted the dynamic dancing duo. A video and an additional photos have been released from this gathering. Sarah, Todd, and brother Trig cheering for Bristol and Mark. Today SarahPAC is launching a new campaign to promote real change during this November’s election: Take Back the 20. SarahPAC has identified 20 House Democrats around the country who voted for the wildly unpopular Obamacare bill earlier this year and are representing districts won by McCain/Palin in the 2008 Presidential Election. The Take Back the 20 campaign is dedicated to helping the 20 outstanding Republican candidates in these races return common sense conservative leadership to their respective districts. To make this happen, we need your help! Please visit our new website, learn about these excellent candidates and make a donation today. With the election being only 40 days away, maximize the impact of your contribution by donating by the September 30th deadline! These 20 races represent half of the battleground districts necessary to send Nancy Pelosi back to San Francisco. In this raucous and rowdy election cycle, it’s easy to lose sight of the overarching goal: take our country back! That starts with turning these 20 blue districts red and by making a donation today, you can help us do just that. In a mailing sent today, GOP Congressional candidate Michael Grimm discusses how his Democratic Party opponent Congressman Michael McMahon is desperate and was specifically targeted by the Democratic Congressional Campaign Committee’s special program for vulnerable incumbents. Grimm is running for New York’s 13th Congressional District, which covers Staten Island and part of Brooklyn. Governor Palin endorsed Grimm on July 28, 2010, along with John Gomez for NY-2 who ran unopposed and won. US for Palin Publisher, Ron Devito is campaigning for Grimm. For the primary, Devito walked door-to-door in the 60th and 79th Election Districts, installed lawn signs in the 10314 zip code, called voters on primary day and closed the PS 36 poll. When Devito arrived to the victory celebration, Allegretti had already called Grimm to concede. Watch Grimm’s victory speech here. Devito is continuing his work for Grimm, preparing to do another door-to-door walking blitz in his own neighborhood and one to the west of his. See US for Palin for complete details on the mailing. Mark Ballas, the professional dancer Bristol Palin is partnered with on Dancing with the Stars is to perform an acoustic set at Rum Runners, in Anchorage tonight. Bristol and Mark are also being interviewed today by Entertainment Tonight. The interview will air on Monday, September 27, 2010. Upon yesterday’s arrival to the Wasilla dance studio where Bristol Palin and Mark Ballas will be rehearsing, a large crowd of fans, including 2012 Presidential hopeful Gov. Palin greeted the dynamic dancing duo. While the duo were enroute to Anchorage, and just under 27 hours after establishing her Facebook Page, Bristol secured 1,000 friends there. US for Palin and venues where its content is syndicated broke both the Facebook page establishment and 1,000 friends milestone stories. 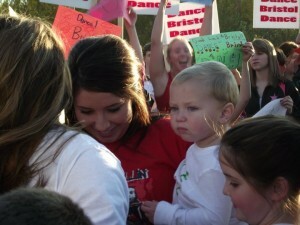 Bristol is a contestant on Dancing with the Stars, and an advocate against teen pregnancy for the Candies Foundation. She was interviewed on Alaska’s Bob and Mark Show with Ballas 45 minutes before her flight departed, and on Tuesday night’s show with Gov. Palin. Her performance of the Cha-Cha-Cha with Ballas propelled Bristol to the Week Two Round of Dancing with the Stars, which airs Monday, September 27, 2010. It’s now six months since President Obama took control of one-sixth of the private sector economy with his health care “reform,” and the first changes to our health care system come into effect today. Despite overwhelming public dislike of the bill, we were told that D.C. knows best, and there was nothing to worry about, and we’d be better off swallowing the pill called Obamacare; so, in defiance of the will of the people, the President and his party rammed through this mother of all unfunded mandates. Nancy Pelosi said Congress had to pass the bill so that Americans could “find out what is in it.” We found out that it’s even worse than we feared. Remember the Obama administration’s promise that Obamacare would cut a typical family’s premium “by up to $2500 a year”? Not true. In fact, fueled by reports that insurers expect premiums to rise by as much as 25 percent as a result of Obamacare, Senate Democrats are contemplating the introduction of price controls. Remember when the president said in his address to Congress that “no federal dollars will be used to fund abortions”? That turned out to be yet another one of those “You lie!” moments. We found out that Obamacare-mandated high risk insurance pools set up in states like Pennsylvania and New Mexico will fund abortions after all. Remember the promise that Obamacare would “strengthen small businesses”? Not true either. The net result of Obamacare is that small businesses will face higher health care costs, new Medicare taxes, and higher regulation compliance costs, while the much-hyped health care tax credit for small businesses turns out to be almost impossible to obtain. Remember the president’s promise that his bill would ensure “everyone [has] some basic security”? False again. Besides the great uncertainly that Obamacare hampers businesses with, companies now find it is actually cheaper to pay the $2000 per employee fine imposed by Obamacare than to keep insuring their workforce. This leaves millions of American workers at risk of losing their employer-provided health insurance. By the way, when the administration was talking about that independent board that has the statutory power to decide which categories of treatment are worthy of funding based on efficiency calculations (that, again, sounded to me like a panel of faceless bureaucrats making life and death decisions about your loved ones – which, again, is what I referred to as a “death panel”), it was another opportunity for Americans to hear the truth about Obamacare’s intentions. So, yes, those rationing “death panels” are there, and so are the tax increases that the president also promised were “absolutely not” in his bill. (Aren’t you tiring of the untruths coming from this White House and the liberals in Congress?) When the state of Florida filed a challenge to Obamacare on the basis that the mandates in the bill are unconstitutional, the Obama Department of Justice filed a motion to dismiss the suit by citing the Anti-Injuction Act, which blocks courts from interfering with the federal government’s ability to collect taxes. Yes, taxes! Once the bill was passed it was no longer politically inconvenient for the Obama administration to admit that it makes no difference whether the payment is a tax or a penalty because it’s “assessed and collected in the same manner.” The National Taxpayer Advocate has already warned that “Congress must provide sufficient funding” to allow the IRS to collect this new tax. Pretty soon we’ll be paying taxes just to make it possible for the IRS to collect all the additional taxes under Obamacare! Seems as if this is another surprise that the public found out about after the bill was rammed through. But perhaps the most ridiculous promise of all was the president’s assurance that Obamacare will lead to “bending the curve” on health care spending. Yes, rationing is a part of the new system, and yes, Obamacare does raise taxes. But because the new government managed system is so incredibly complicated and expensive to run, health care spending will actually rise instead of fall. Don’t believe me? Then take a look at the Congressional Budget Office’s admittance that the CBO’s original estimate of the total costs of the bill were off by around $115 billion. Its new estimate is now above $1 trillion, and even that may be way too low. A more realistic figure calculated by the Pacific Research Institute puts the number at $2.5 to $3 trillion over the next 10 years! This is probably what President Obama was referring to when he admitted recently that he had known all along that “at the margins” his proposals were going to drive up costs. Give us a break! Only in this administration would they refer to a $3 trillion spending increase as “marginal.” Next time he comes to us with another one of his harebrained proposals for a budget-busting federal power grab, let’s make sure we remember the president’s admission that he was lying all along when he told us his health care plan was going to cut costs. He is increasing costs. He admits it now. Period. Higher costs and worse care – is it any wonder why people are overwhelmingly in favor of repealing and replacing Obamacare? Politicians who have vacillated on this issue need to be fired. Candidates who don’t support “repeal and replace” don’t deserve your support. No amount of money spent on Washington’s “government-wide apolitical public information campaign” (otherwise known as “propaganda”) will convince Americans that this awful legislation is anything other than a debt-driven big government train wreck. We need to repeal and replace it, and that can only happen if we elect a new Congress that will make scrapping Obamacare one of its top priorities. We can replace it with pro-private sector, patient-oriented reform that the GOP has proposed. On March 23, when Obamacare was signed into law, I launched my “Take back the 20” campaign, focusing on 20 congressional districts that John McCain and I carried in 2008 which are or were represented by members of Congress who voted in favor of Obamacare. They need to be held accountable for those votes. They voted for Obamacare. Now we can vote against them. We need to replace them with representatives who will respect the will of the people. That’s why today I’m launching a new Take Back the 20 website at http://www.takebackthe20.com! TakeBackthe20.com provides information about the candidates in these 20 districts who are committed to repealing and replacing Obamacare. It has links to their personal websites and their donation pages. It allows you to read up on them, and then support them in their race to defeat those who gave us this terrible bill. We have to send Washington a message that it’s not acceptable to disregard the will of the people. We have to tell them enough is enough. No more defying the Constitution. No more driving us off a financial cliff. We must repeal and replace Obamacare with patient-centered, results-driven, free market reform that provides solutions to people of all income levels without bankrupting our country. It’s time to make a stand! Let’s take back the 20! Gov. Palin cheers Bristol upon arrival outside Wasilla Studio where Team Ballin Will be Rehearsing. Photo courtesy of Julie Gillette, Dance Bristol Dance. 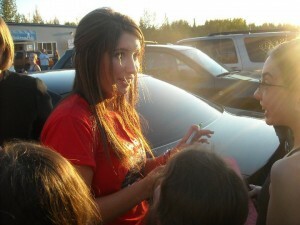 Bristol Palin signs autographs outside Wasilla Studio where Team Ballin Will be Rehearsing. 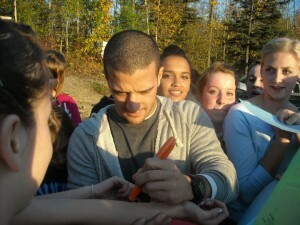 Mark Ballas signs autographs outside Wasilla Studio where Team Ballin Will be Rehearsing. Bristol Palin greets fans outside Wasilla Studio where Team Ballin Will be Rehearsing. 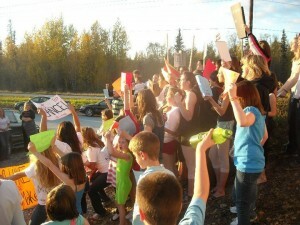 Crowd waits to greet Bristol Palin and Mark Ballas outside Wasilla Studio where Team Ballin Will be Rehearsing. Governor Palin made an appearance on “On the Record” with Greta Van Susteren tonight, live from Alaska. She discussed Christine O’Donnell, Lisa Murkowski, and a possible run for the presidency. Here’s the video, via Ian Lazaren (via the Right Scoop).